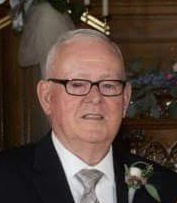 On Saturday, March 16, 2019 Leonard (Butch) Balch went peacefully to join his wife Josephine of 65 years. He died of a broken heart after losing her on March 7, 2019. Born October 24, 1932, he was 86. He is survived by his daughters Cathy and Robin Smith; Cindy Balch; son Leonard, Jr.(Sam) and Karen Balch; grandchildren Brandon and Melissa Smith, Brittany and Brian Bahurinsky, Nicholas Balch, Stephen Balch; great grandchildren Emma Jo Bahurinsky and Joselyn Smith; several nephews, nieces, cousins and faithful dogs Max and Toby. He was also predeceased by his parents Edgar and Doris Balch; brother Robert Balch; sister Amy L. Knapp. Leonard was proud to service his country in the US Marine Corp. He retired from IBM after several years of service. He loved spending time with family and friends. He loved his toys – boats, tractors, snowmobiles, and spending summers on Cayuga Lake. He was a great dad, gramps and great grandpa and a friend to all who knew him. He will be dearly missed. You will always be in our hearts. Continue watching over us as you always have. The family would like to thank the Town of Maine Ambulance Squad for their service. A Funeral Service will be held on Wednesday at 10AM, at the Barber Memorial Home, Inc., 428 Main St, Johnson City. Burial will be in Vestal Hills Memorial Park. The family will receive friends on Tuesday, from 4PM-7PM, at the Barber Memorial Home. In lieu of flowers, donations can be made in memory of Leonard to the American Diabetes Association, PO Box 15829, Arlington, VA 22215.